Endosperm is a food reserve tissue inside the seeds of most flowering plants. It surrounds the embryo and provides nutrition in the form of starch. It may also contain oils and protein. The endosperm of cereal plants is an important source of nutrition for humans. Wheat endosperm is ground into flour for bread. With whole wheat bread the bran (cover of seed) is also in the flour. Barley endosperm is the main source for beer production. Other examples of edible endosperms are coconut 'meat' and coconut 'water', and corn, including popcorn. Some plants, like the orchids, lack endosperm in their seeds. Primitive (basal) flowering plants have seeds with small embryos and big endosperms. The evolutionary development of flowering plants tends to show a trend towards plants with seeds with little or no endosperm. In more derived flowering plants the embryo occupies most of the seed and the endosperm is not developed or consumed before the seed matures. In these plants, the cotyledons contain the food reserve. Endosperm is formed when the two sperm nuclei inside a pollen grain reach the inside of an ovule or embryo sac. One sperm nucleus fertilizes the egg, forming a zygote, while the other sperm nucleus usually fuses with the two polar nuclei at the center of the embryo sac. This makes the first endosperm cell, which develops into the endosperm. Because it is formed by a separate fertilization, the endosperm is an organism distinct from the embryo (though placed next to it in the seed). About 70% of angiosperm species have endosperm cells that are polyploid. These are typically triploid (containing three sets of chromosomes) but can vary widely from diploid (2n) to 15n. 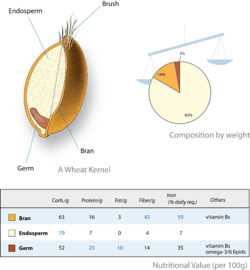 Endosperm Facts for Kids. Kiddle Encyclopedia.